Looking through my dupliate/spares yesterday I had an idea. I could complete my Space Explorer set if I took the Mechanical Excavator from a battered and broken Terrain EX1 and fit it on the back of the spare Radar Dish trailer to create the missing Mechanical Excavator! So I now have a full Space set plus a full Polar set. This now means I have a miss coloured Radar Dish mounting which can be remedied by a paint job to complete my Ocean set. I still have the problem of not enough trailer chassis but I do have a good few busted by primary vehicles chassis which can be disassembled and modified into trailers by use of the included tow bars. 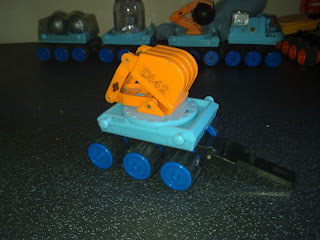 This is due to the modular construction of the vehicles, if you look at the parts the toys are constructed of you'll see their all the interchangeable just with different coloured plastic. More to come on this topic! well im so glad youre able to make use of all the parts! Excellent work! Thank you so much for making this blog. 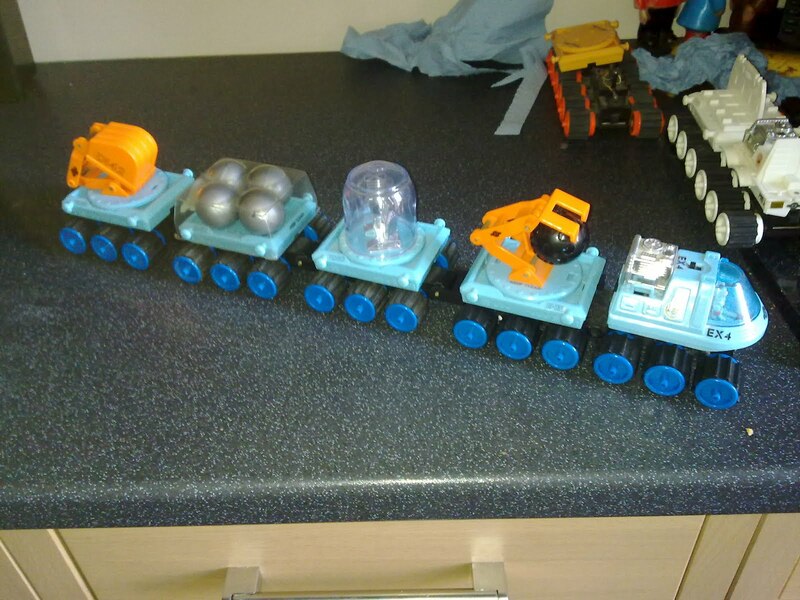 These were my absolute favourite toys in the 80s and had the whole set, all 4 explorers with a lot of the track/platforms. I never get rid of anything and still have most of my toys from the 80s but I think this was given away for me... I was previously unable to find any info but hopefully in the future I will get a few select pieces and relive the past memories. Hi there. Found an old explorer tyre in a bag of lego that i'd got out of the loft that I hadn't opened since the early 1990's. Couldn't remember the name of the toys only an image in my befuddled brain. After a long Google search going down a few dead ends... I thought the toys were space based i.e on the moon. 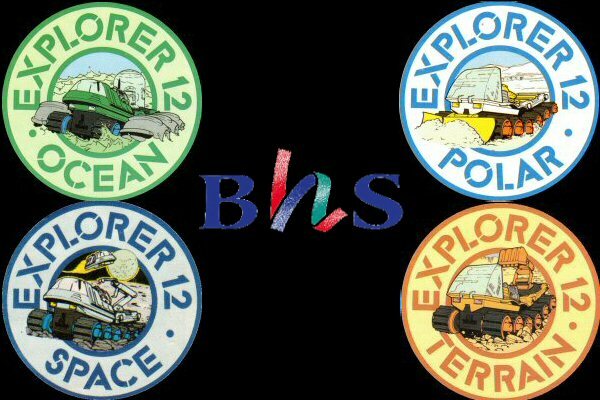 I stumbled on a pic when i tried 'BHS Space toys' that lead me to the Explorer 12 answer to my search. Now, having seen this site, i remember i had the one that went in the bath 'ocean' and perhaps another. Anyway they are long gone now but it was great to skip down this nostalgic road. Great site. Good to see someone still holding the torch. I'll be keeping my eye out at Toy fairs etc. Would be cool to pick up on for old times sake. Right, I'm off to track down another toy I vaguely remember. A blue jet with swing wings (sotra shaped like a Rockwell B2) that could split in two at the nose (becoming 2 ships) and had a cargo bay at the back that a small metal fighter could dock on and would pop out when the wing were moved. 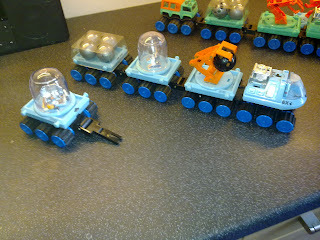 And it wasn't micro macheins but the range was based aroung mini-tanks and jets. Ho-hum. Thanks again. Will. I had that plane! I believe they were Tonka megaforce I think I must add!